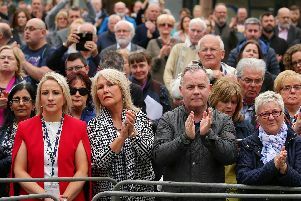 Eileen O'Riordan (centre) following the funeral of her daughter and The Cranberries singer Dolores O'Riordan at Saint Ailbe's Church, Ballybricken. Cranberries singer Dolores O'Riordan had a loving heart, a voice of gold and starred in the gig of life itself, mourners at her funeral have heard. Hundreds who packed into a small church in rural Co Limerick to say farewell to the musician were told she is now singing in a heavenly choir. O'Riordan's distinctive voice, described during the mass as unique, far reaching and distinctly Irish, filled the Church of Saint Ailbe in Ballybricken at the outset, as her duet of Ave Maria with Luciano Pavarotti was played. The 46-year-old was found dead in a London hotel room last week. In his homily, family friend Canon Liam McNamara said O'Riordan's voice was worth its weight in gold. The Cranberries enjoyed huge success in the 1990s with tracks including Zombie and Linger. O'Riordan - who was also a member of alternative rock group DARK - had been working on a new studio album with The Cranberries in the months before her death. Her boyfriend and fellow DARK band member Ole Koretsky was among mourners at the service. Her three children Taylor, Molly and Dakota and her stepson Donny also attended along with ex-husband Don Burton. The artist's mother Eileen, sister Angela and brothers Terence, Brendan, Donal, Joseph and PJ comforted each other in the small parish church. Canon McNamara extended sympathies to all her family and her Cranberries bandmates Noel Hogan, Mike Hogan, and Fergal Lawler. Cranberries fans from around the world tuned into a local Limerick radio station on Tuesday morning as it broadcast the service live. At the outset of the mass, symbols associated with O'Riordan's life were brought to the altar. A long-time friend and a niece brought forward a guitar and a platinum disc award. A picture of Our Lady of Dolours, after whom Dolores was named, was placed at the altar, as was a book of poetry. Mourners then paused for a moment's silence and a prayer before her sister Angela read a passage of scripture. In a service with a strong family focus, a number of O'Riordan's nieces, nephews and godchildren played roles. Canon McNamara said the singer had reached out to the world and put Co Limerick on the map. He recalled meeting the young O'Riordan in 1989 when she was singing and playing the keyboard in the church. "She possessed a very special singing voice - a talent worth its weight in gold," he said. "Intelligent girl that she was, she knew well that she should develop and use that talent. She also knew that talents were given by almighty God to be used generously for the benefit of others." He added: "She did have an unique respect for everybody. "Coupled with that respect, her kind, loving and generous heart, made her a source of great hope to the Church, during its stormy years. For that we sincerely thank her from our hearts." He said the funeral mass was a difficult day not only for Ballybricken, but for the world. "Now she is singing in the heavenly choir - hymns of petition for us," he said. Canon McNamara said O'Riordan had been reunited with loved ones in heaven, including her late father Terry. "If tears are shed in heaven - by necessity they are tears of joy," he said. During communion, O'Riordan's haunting version of the hymn Panis Angelicus was played in the church. Archbishop of Cashel and Emly Kieran O'Reilly hailed her one of a kind voice. "Since we heard of the sudden death of Dolores O'Riordan, many hearts in Ireland and around the world are heavy with sadness on hearing the news," he said. "Indeed, the great outpouring of sympathy and love for Dolores which we have seen since her death is a witness and a tribute to her great musical talent and very special voice by her many fans and lovers of music. "Dolores put her God-given talents at the service of others." "Her gifts have resonated in the lives of many and will continue to do so as her music and her songs will continue to be played and listened to," he said. "Her singing voice was unique, far-reaching and distinctly Irish. "In an interview after meeting the now Saint Pope John Paul II, Dolores stated that her faith was one of her greatest musical influences. "She said the Church had nurtured her development as an artist and musician and, for her, her faith was always important - a source of strength in her life." At the close of the service, the Cranberries song When You Are Gone rang around the church as the singer's remains were brought to the nearby graveyard for a private burial service. Mourners broke into a spontaneous round of applause. Sales and streams of The Cranberries' back catalogue rocketed by 1,000% in the days since her death.